Anthropogenic debris deposited in the marine environment is commonly mistaken for prey by seabirds. In some species, a high proportion of adults and chicks hold synthetic materials in their digestive systems which can cause poisoning, intestinal damage and obstruction, malnutrition and starvation. Anthropogenic debris affects over 44% of seabird species worldwide through entanglement and ingestion (Laist 1997). Over 13,000 pieces of plastic float on every square kilometre of ocean, and this floating marine debris is transported for thousands of miles on ocean currents to pollute even the remotest of shores (Derriak 2002, UNEP 2005). Debris enters the ocean via waste disposal from sea-going vessels, offshore dumping, litter left behind by beachgoers and run-off from rivers and drainage systems (Pierce et al. 2004,Sheavly 2007). Although the disposal of waste in the marine environment is managed via various international conventions and agreements, oceanic pollution is still a significant problem with ships estimated to dump 6.5 million tons of plastic annually (Derraik 2002, Hartwig et al. 2007). Seabirds can mistake plastic floating on the ocean’s surface for prey and ingest it alongside food items. Some 80% of large floating plastic pieces washed ashore on beaches in the Netherlands show peck marks from birds at sea (Derriak 2002, Cadée 2002). While 95% of Great Shearwater Puffinus gravis, 93% Blue Petrel Halobaena caerulea and over 80% of Northern Fulmar Fulmaris gracialis hold plastic in their digestive systems (Ryan et al. 1987, Moser and Lee 1992), and plastic, nylon, rubber and metal wire have been found in 36% of Northern Fulmar and 29% of Black-browed Albatross Thalassarche melanophrys stomachs (Mallory et al. 2006, Petry et al. 2007). Most adult birds regurgitate ingested debris, which means they pass it on to their chicks while feeding them (Derraik 2002, Allsopp et al. 2006). An estimated 98% of Laysan Albatross Phoebastria immutabilis chicks, and 73% of Southern Giant-petrel Macronectes giganteus chicks were fed beads, synthetic foam, fishing line, buttons, cigarette lighters, toys, PVC piping, plastic bags, golf tees, dish-washing gloves, marker pens, aluminium foil, metal wire, neoprene o-rings, lightbulbs and rope by parents who have swallowed these objects accidentally at sea (Auman et al. 1997, Copello and Quintana 2003). Ingested debris can obstruct and physically damage a bird’s digestive system, reducing its digestive and foraging ability and can lead to malnutrition, starvation and death. One Laysan Albatross chick had a piece of plastic wedged crosswise in its gut that was more than 11cm long (Ryan 1987, Auman et al. 1997). Toxic chemicals called polychlorinated biphenyls (PCBs) also become concentrated on the surface of plastics at sea and are released when seabirds ingest them. These chemicals can build up in body tissues and have serious detrimental effects on a birds reproductive ability, immune system and hormone balance (Derraik 2002). This is clearly a widespread problem and, although this type of pollution is documented as a threat for only a few globally threatened species (including Laysan Phoebastria immutabilis and Wandering Albatross Diomedea exulans, Humboldt Spheniscus humboldti and Royal Penguin Eudyptes schlegeli), the number of birds affected and the population impacts of this ingestion are unknown. Allsopp, M., Walters, A., Santillo, D. and Johnston, P. (2006) Plastic debris in the World’s oceans. Amsterdam: Greenpeace International. 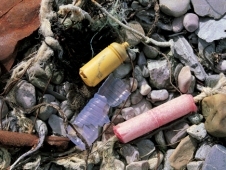 Auman, H. J., Ludwig, J. P., Giesy, J. P. and Colborn, T. (1997) Plastic ingestion by Laysan Albatross chicks on Sand Island, Midway Atoll, in 1994 and 1995. Pp. 239–244 in G. Robinson and R. Gales, eds., Albatross biology and conservation. Chipping Norton: Surrey Beatty & Sons. Cadée, G. C. (2002) Seabirds and floating plastic debris. Mar. Pollut. Bull. 44: 1294–1295. Copello, S. and Quintana, F. (2003) Marine debris ingestion by Southern Giant Petrels and its potential relationships with fisheries in the Southern Atlantic Ocean. Mar. Pollut. Bull. 46: 1504–1515. Derraik, J. G. B. (2002) The pollution of the marine environment by plastic debris: a review. Mar. Pollut. Bull. 44: 842–852. Hartwig, E., Clemens, T. and Heckroth, M. (2007) Plastic debris as nesting material in a Kittiwake (Rissa tridactyla) colony at the Jammerbugt, Northwest Denmark. Mar. Pollut. Bull. 54: 595–597. Mallory, M. L., Roberston, G. J. and Moenting, A. (2006) Marine plastic debris in northern fulmars from Davis Strait, Nunavut, Canada. Mar. Pollut. Bull. 52: 800–815. Moser, M. L. and Lee, D. S. (1992) A fourteen-year survey of plastic ingestion by western North Atlantic seabirds. Colon. Waterbirds 15: 83–94. Petry, M. V., da Silva Fonesca, V. S. and Scherer, S. L. (2007) Analysis of stomach contents from the black-browed albatross, Thalassarche melanophris, on the coast of Rio Grande do Sul, Southern Brazil. Polar Biol. 30: 321–325. Pierce, K. E., Harris, R. J., Larned, L. S. and Pokras, M. A. (2004) Obstruction and starvation associated with plastic ingestion in a Northen Gannet Morus bassanus and a Greater Shearwater Puffinus gravis. Mar. Ornithol. 32: 187–189. Ryan, P. G. (1987) The effects of ingested plastic on seabirds: correlations between plastic load and body condition. Environ. Pollut. 46: 119–125. Sheavly, S. B. (2007) National Marine Debris Monitoring Program: Final Program Report, Data Analysis and Summary. Prepared for U.S. Environmental Protection Agency by Ocean Conservancy.